Be the first to share your favorite memory, photo or story of Jewell. This memorial page is dedicated for family, friends and future generations to celebrate the life of their loved one. Our beloved Rusty took leave of her presence on this Earth on February 3, 2019 in Bozeman, Montana at age 91. 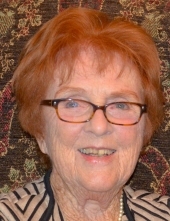 Jewell was born on March 1, 1927, and grew up in Nora Springs, Iowa, where she excelled at gymnastics and outdoor hijinks as the “middle sister” with bright auburn hair, taking World War II rationing in stride and helping with the family creamery business. Her first day at Grinnell College Jewell’s roommates dubbed her “Rusty,” and she kept that nickname—and her red hair—her entire life. Rusty graduated from Grinnell with a degree in Speech/Drama in 1948, and became a speech therapist in Elgin, Illinois schools. Rusty met the love of her life, handsome engineer Bill Freeburg, in Elgin, where he had grown up on his family’s dairy farm. She always joked that when she met him, Bill had two horses, a red convertible, and no job, but he was great fun. They were married in Nora Springs, Iowa on July 1, 1950, and soon after moved south to their own dairy farm adventure outside of Gravette, Arkansas. Their family expanded with daughter Laura Jane (Janie) and William Bradley (Brad), cows, horses, collie dogs and barn cats, until time for the kids to go to school, when they moved to Tulsa, Oklahoma; to Bellevue, Washington; and then to the Los Angeles area where Bill’s career rose in the growing aerospace industry and Rusty excelled as a hostess, mother, gardener, and elementary school aide. Their third child, David Allen (Dave), was born in California. While Jane and Brad attended California universities, Rusty and Bill moved with David to Yankton, South Dakota where Bill had accepted a position as president of a steel company. In Yankton Bill enjoyed having horses and a boat, and Rusty was active in restoring the gardens at the Kramer-Kenyon Home Historical Museum. She was able to visit Europe while Brad was working in Munich, and to enjoy many ambitious projects including doll collecting. They were able to visit Montana often, to see Rusty’s sister and brother-in-law Doris and John Salsbury in Bozeman, and nephew Doug Salsbury of Tomahawk Ranch near Whitehall. Rusty and Bill were in the process of retiring to Bozeman when Bill died suddenly in August 1990. Rusty followed through with their plan and created an active, busy life for herself in Bozeman. She delighted in her garden, her pets, her friends, and activities with family and guests. One of her great joys was spending time with her granddaughters Noelle and Katie—she made the loft in her home a magical space with dolls and dollhouses. She served as a docent at the Museum of the Rockies, supported the Bozeman Symphony and the Montana Chamber Music Society, and spent many happy hours walking her Westie on the Sourdough Trail. Rusty was a warm and generous friend, a great cook and hostess, and an independent spirit. Her sharp wit and sense of fun will be missed by her many friends and neighbors old and new. Rusty is survived by her immediate family in Bozeman: Jane (Mark Schlenz); Brad (Danielle); and Dave; granddaughters Noelle and Katie; nephews Doug Salsbury and Craig Salsbury, grandnieces Sarah Salsbury and Emily Salsbury Black, a wide circle of nephews and nieces on both coasts, and her beloved kitty, Olivia. Donations in her honor may be made to the Heart of the Valley Animal Shelter or a charity of one’s choice. The family plans a Celebration of Life in the spring. Condolences and memories may be shared with the family at www.dahlcares.com. To send flowers or a remembrance gift to the family of Jewell Marie "Rusty" Brunner Freeburg, please visit our Tribute Store. "Email Address" would like to share the life celebration of Jewell Marie "Rusty" Brunner Freeburg. Click on the "link" to go to share a favorite memory or leave a condolence message for the family.